Does anyone know who is in following photos? Photo number one is my grandfather Gilbert. The back of the photo says “Pete, Philly, Leona, and Turk”. Photo number two -we were told that the brothers lured Pietro to the roof top to snap his photo, he hated to have his photo taken. I think Gilbert is with Pietro. Photos number three and four are unknown. Today my father Robert Thomas Winike would have been 86 years old. He died in 1970 when he was 41 from lung cancer. Click on the image to the left to enlarge. My father is on the far left, third row from the top. One of my goals this year was to find out more about dad’s father Frank. I have not been successful in my search for my grandfather’s story but I have uncovered some wonderful research about my father’s great grandfather. So today we celebrate a Civil War hero. 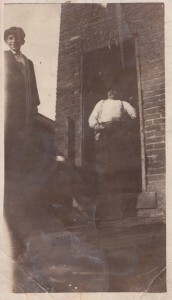 My second great grandfather, Charles Frey, was born in Germany in Jan 1842. 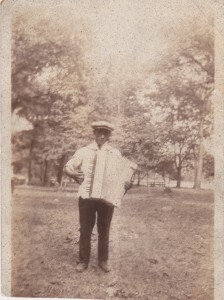 He immigrated to Monroe, Wisconsin in 1854 at the age of 12. I don’t yet know who he traveled to the U.S. with or why he left his homeland. Charles married Anna Rinehart in 1866 and they had a daughter named Matilda (Tillie) in 1880, my great grandmother. Tillie married Edward Norder on New Year’s day in 1902. They had a daughter named Grace in 1908, my grandmother. 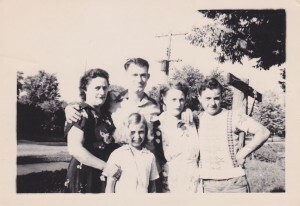 Grace married Frank Winike and they had a son named Robert in 1928, my father. 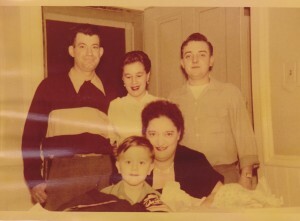 The photo above is Joe Rachor, my mother Corinne, and my father Robert. Dad’s mother Grace is sitting with my brother Bob. The photo below from left to right is my grandmother Grace, her second husband Joseph Rachor, Grace’s sister? ?, and my father. I don’t know the name of the child. On 14 Oct 1861 at the age of 19 Charles enlisted in the civil war. His service was with the 2nd Battery Wisconsin Light Artillery. He volunteered for 3 years, then he re-enlisted and was discharged 10 Jul 1865. This is the first family member that I am able to document who served in the Civil War. This is a huge discovery for me. I have visited Fredericksburg and Gettysburg and can’t believe what these brave soldiers went through on the battle field. My 2nd great grandfather served for 3 years, 8 months and 26 days. Click here (line 9) to read a pdf from the United States Census of Union Veterans and Widows of the Civil War 1890. This document was found at the FamilySearch website. The document states Charles was a corporal and served from 14 October 1861 to 10 July 1865. He was wounded when he was kicked by a horse in his left side (see lower section of document, line 9). The image below left is the “Military Pension file for 1861-1934” for Charles. It shows his wife as Anna Frey. It was filed 24 Feb 1890 in Wisconsin and listed Charles as an invalid. He died on 17 May 1901 and his widow received the benefits. The first pension law for Union widows, orphans and disabled soldiers was enacted in 1862. Records indicate that only 12 men died in Charles Battery and the loss was due to disease. Click to enlarge the photos. The image above right is a Civil War Military Pension Index for 1861-1917 from Fold3. It shows Charles served in Company 2, Wisconsin Light Artillery and is dated 24 Feb 1890. I believe the original documents are found on microfilm M559, Roll 10. We can obtain copies from NARA in person or by filling out a form online on this page. The cost is $80.00 for up to 100 pages. This record is whispering “buy me”. It’s tempting! Click this NPS page to view another clue about Charles. His name was recorded as Carl Frey III. Now I can search for his father and grandfather under the names of Carl or Charles. This page confirms that he enlisted as a private and was discharged as a corporal. Click this NPS page to read where Charles unit served through out the war. All Civil War Army pensions application files at NARA are in the “Civil War and Later” series in Record Group 15. The majority of these files are not microfilmed or digitized but some are at Fold3. A widow’s pension was $8.00 per month. I went to the section called “United States Census of Union Veterans and Widows of the Civil War, 1890” and typed in Charles name. His record did not come up but you can click here to read a pdf of a Declaration – Widow’s Army Pension that my great grandfather was a witness to. This document tells us so much. It’s dated 08 Jul 1864 from the county of Milwaukie, state of Wisconsin. Henrietta Schroeder Gessner is 37 years old and has two children. Her husband, Heinrich Gessner was killed in battle 19 Jun 1864. 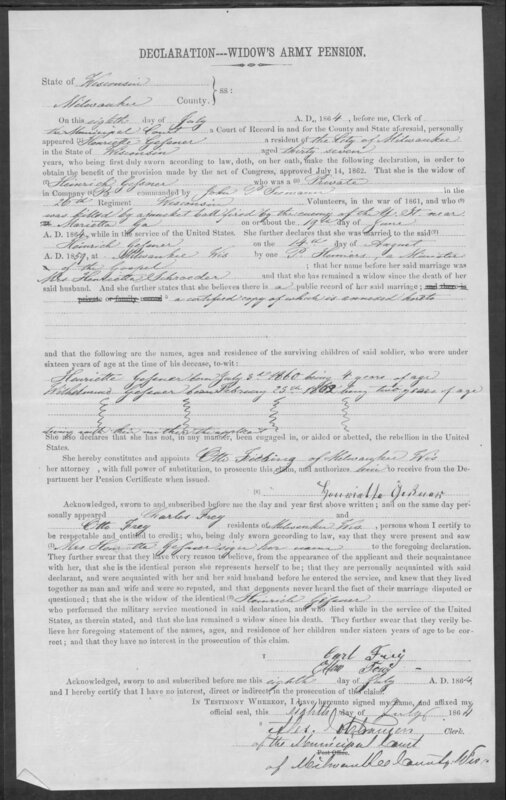 The document asks Henrietta to swear that the following facts are true: the name of Heinrich’s commander, the name of his company, that Heinrich was a private, and that he “was killed by a musket ball fired by the enemy near Marietta, GA.” She states that she was Heinrich’s wife and gives the date of the marriage, who married them and that she is still a widow and is asked to attach her marriage certificate. She provides two witnesses to attest that she is Heinrich’s widow and Charles Frey is one of them. Charles signed the document “Carl Frey”. Now we have a record of what his signature looked like, plus we have a clue we need for future searches, he went by the name of Charles and Carl. In 1866 when he was 24 Charles married Anna Rinehart (born in 1848) and they had five children: Edward born 1866, George born 1872, Albert, Matilda (Tillie) born 1880, and Magdalena born 1887. 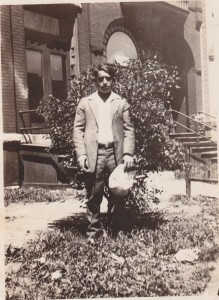 The 1900 census lists Charles occupation as a carpenter living at 336 Main St in Monroe, Wisconsin. He owned his home free of a mortgage. Charles served almost the entire length of the Civil War. He passed away in Monroe Wisconsin on 17 May 1901 at the age of 59. How did this wonderful story get lost in our family? I’m so grateful for paper trails that help us learn about our ancestors lives and where we came from so we can share their amazing stories with our children. In May 2014 I received the results of my DNA test through Ancestry.com. I was surprised to find that I am 33% Scandinavian. I wondered how much of this percentage was due to my paternal ancestors. My paternal great grandparents were Edward Norder born Sep 1880 in Monroe Wisconsin and Matilda (Tillie) Frey born Jul 1880 in Monroe Wisconsin. It was time to ask Kathy from GenTracer to work her magic with some research on my father’s ancestors. Thank you Kathy for your hard work! The first few paragraphs of Kathy’s research gave me many new clues to help in my investigation. I thought my great grandfather’s first name was Edwin, but it was Edward. I didn’t know my great grandmother Tillie’s maiden name which I now have. It is Frey. My great grandmother Tillie’s parents were Charles Frey born Jan 1842 in Germany (died 17 May 1901) and Anna Rinehart born Jun 1848 in New York. They were married in 1866. Charles and Anna had five children: Edward, Albert, George, Matilda, and Magdalena. My great grandfather Edward’s parents were Richard Norder born Mar 1848 in New York and Fannie Blum aka Blumer born Dec 1854 in Wisconsin. They were married in 1874. Fannie’s father was Rudolph Blum born in Switzerland in Apr 1809. Richard and Fannie had six children: Ida, Edward, John, George, Alice, and Harry. 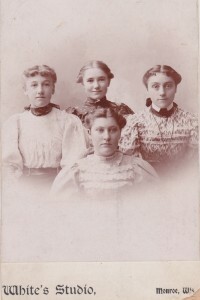 The photo below is Grace with her three sisters. 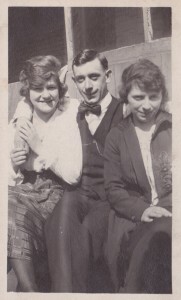 From left to right: my grandmother Grace (far left) born 1908, Irene (in the white hat) born 1902, and Grace’s husband Joseph Rachor. 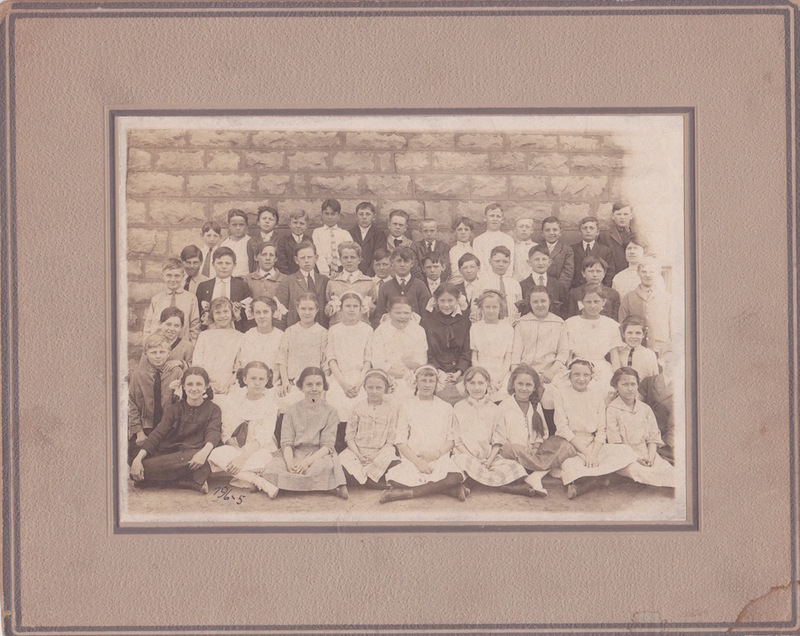 Gladys (Frannie) born 1905, and Agnes born 1913 are also in the picture but I’m not sure which woman is in the light coat and which one is in the dark coat. I had hoped to uncover some information about my grandfather but Kathy hit a brick wall. Dad’s mother was Grace Norder and she married Frank Winike. My father’s death certificate has his parents names. In an effort to find out more about my grandfather I have written to both the state of Illinois and the state of Wisconsin for dad’s birth certificate. No record of birth was found in either state. Recently I applied for dad’s social security application in the hopes there will be information on the form about my grandfather. We were told that Frank abandoned Grace and my father when dad was 2 years old. 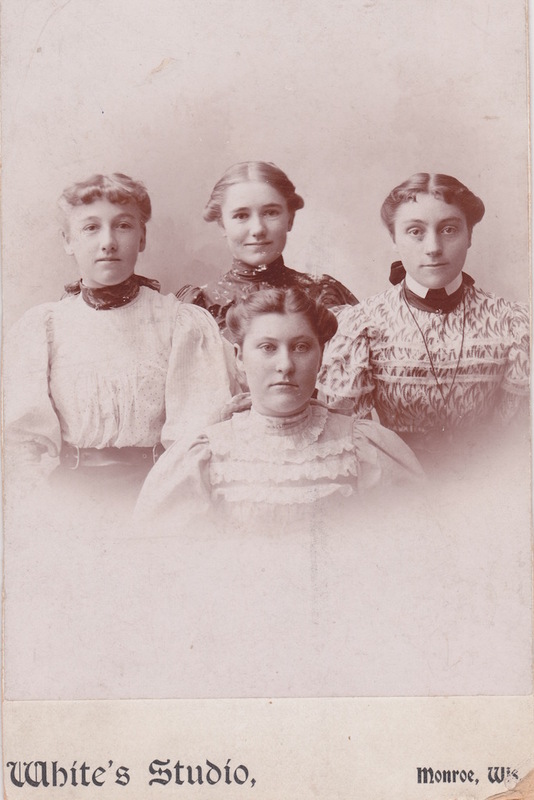 Soon after Grace moved to Chicago to be near her sisters Irene, Gladys (Frannie), and Agnes thus setting the stage for mom and dad to meet, fall in love, and marry. Click this link to view my father’s Ancestor Report. Click this link to view Pedigree Charts and Family Group Records. Below are some excerpts from Kathy’s research project. Wishing you all a joyous Christmas! The research goal was to extend ancestral lines in Chicago for parents of Robert Thomas Winike (1928-1970). 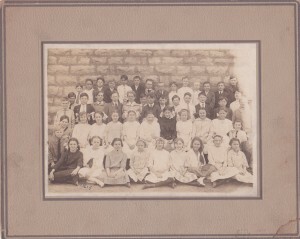 The search began with the Wisconsin births and Christenings 1826-1926 (FHL #1302876 and found at www.familysearch.org). 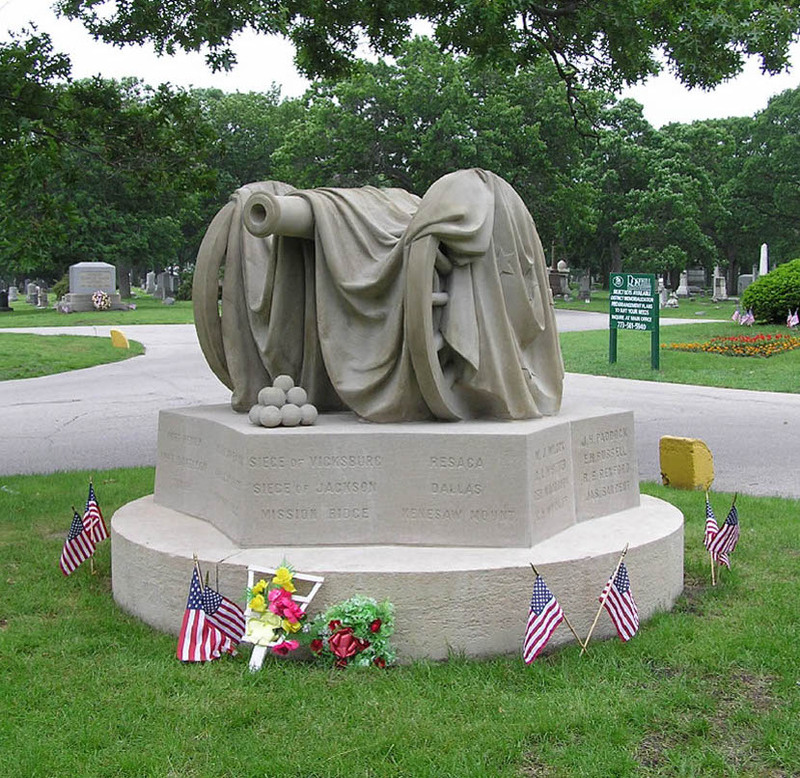 They included the birth of a female Norder on 8 October 1905 in Monroe, Green, Wisconsin. She was born to Edward Norder (born in Monroe) and to Tillie Frey (born in Monroe). The Wisconsin births and Christenings 1826-1926 (FHL #1305129 and found at www.familysearch.org) included the birth of Ralph Norder on 3 May 1904 in Milwaukee, Milwaukee, Wisconsin. He was born to Edward Norder (born in Wisconsin) and Tillie Frey (born in Wisconsin). a) The marriage of Edward Norder to Matilda Frey on 1 January 1902 in Monroe, Green, Wisconsin. 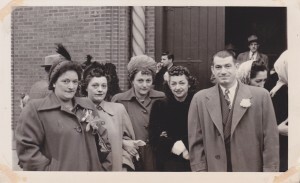 The groom was born in Monroe to Richard Norder and Fannie Blumer. The bride was born in Monroe to Charles Frey and Anna Rinehart. b) The marriage of Albert Frey to Ida Norder on 15 December 1897 in Monroe. The groom was born in Monroe to Charles Frey and Anna Reynhart. The bride was born in Monroe to Richard Norder and Fanny Bloom. c) The marriage of Geo (George) Frey to Rosa Ruegger in June 1902 in Monroe. The groom was born in Monroe to Charles Frey and Anna Rhinehardt. The bride was born in New Glarus, Wisconsin to Martin Disch and Katharine Zeutner. Barbara has graceously shared Charles Ciolli’s Pizzelle pastry recipe. 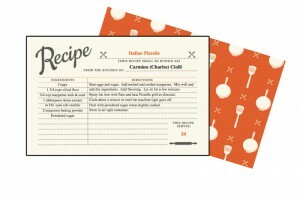 The recipe is not Charles’ original recipe, but it’s pretty close. Barbara made the cookies this year at Easter. 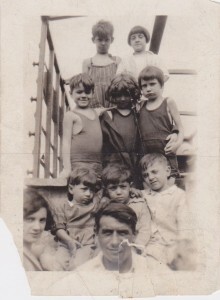 Carmino (Charles) Ciolli is Barbara’s grandfather and is the brother of my great grandmother Elvira. You can read a blog post about Charles by clicking here or by clicking on his name in the category section on the right side of the page. 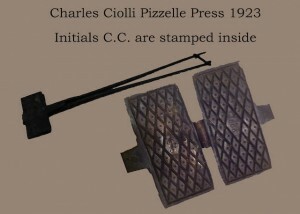 Barbara sent me the photo below of Charles’ press and it’s handle. The press was used over an open flame on a gas stove. Barbara said “it weighs a ton and dates back to 1923”. 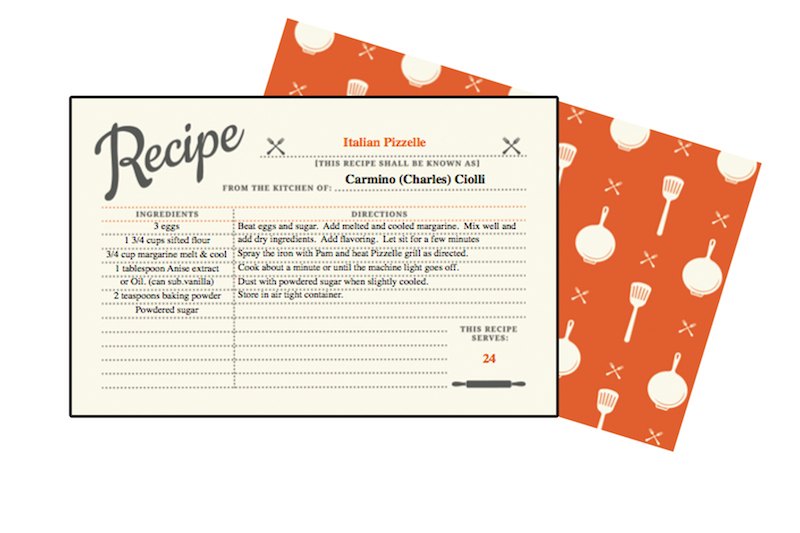 Click on recipe card above or the photo below to see enlargements. The following is some information I found about these cookies. Pizzelle pastries were originally made in Ortona, in the Abruzzo region of south central Italy. The name comes from the Italian word for “round” and “flat”. The Pizzelle iron was held by hand over a hot burner on the stove top. The iron stamps a snowflake pattern onto both sides of the thin golden brown cookie. Pizzelle are popular during Christmas and Easter and are often found at Italian weddings. It is also common for two pizzelle’s to be sandwiched with cannoli cream (ricotta blended with sugar) or hazelnut spread. Pizzelle can also be rolled while still warm using a wooden dowel to create cannoli shells. So I ordered a Pizzelle Press. It does not have my initials in it and does not weight a ton and it plugs into the wall. I bought it on Amazon.com. Yesterday Ashley, Abby, and I made our own Pizzelle cookie memories and started a new tradition. Next up – Ashley wants to make Cannolis. Barbara also shared photos of the Lamb cake that she made at Easter. The mold is her mother’s and is at least 60 years old. I love that Barbara continues these family memories with her children and grandchildren. Thank you for sharing with us Barb!